The leaked information follows the jump, if you don’t want to know what T-mobile is planning on offering, haven’t yet seen or want to be surprised everything after the read link is going to spoil something for you. 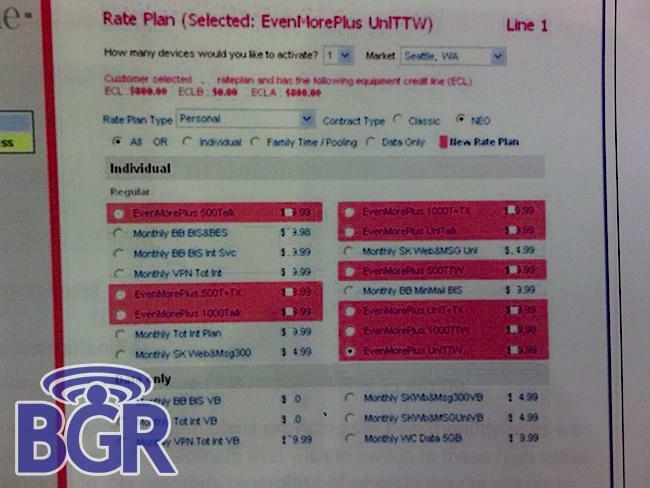 With the recent leaked pics of the Even More and Even More+ rate plans T-Mobile will be offering, confirmation pics of the much suspected rate plans are detailed. Project Dark/Black is rumored to include unlimited rate plans. The Even More and Even More Plus plans, as they are called, will have different approaches. Even More will require a 2-year contract commitment which includes handset subsides, while the Even More Plus plan, on the other hand, will not require a contract and will not include subsidies. The Even More+ plans are very similar to T-Mobile’s current FlexPay plans. But Even More+ would let customers choose any handset and pay for it in monthly installments. Awesome right? More pics after the break! Sound off in the comments or discuss in our awesome forums! so there is an activation fee for current tmobile customers? I’m confused. I just want the Cliq and that’s it. What will I have to do??? Cool, but cant wait to see more details about it, like pricing isnt clear in this yet. Ah, thanks. Yeah I have 10 months left on my contract. Guess I’ll pop into the Tmo store after they officially announce this. Oooooh, much for that confidentiality agreement dealie. Good stuff, but I hope there’s more to PD/B than this. Nice to see people care about having their jobs so much that they don’t think they wouldn’t get fired for leaking this. this makes me happy! now i also wonder, are the phones from the UK gonna be available to the USA too? i hope they have a cheap everything unlimited then i wouldn’t mind having a 2 year contract :D! Kinda confused. How would this plan benefit me…a current cust. with 3 lines on a fam share plan. I pay 140/month for unlimited texts 700 mins monthly and unlimited web on 2 of the 3 lines….1 is a tmobile wing and the other is a mytouch 3g…. This is great news, however the person who leaked may soon be fired ! T-Mobile is very strict with keeping this confidential and “in the dark” with its competitors. If your a T-mo emp. like me then you know the lengths they will go to not let employees ruin this big project !. Also if you notice in these pics ,,where are the MyFavs >>? Everyone will sure be in for a shock. Its going to be great… Good to see price changes and the good deals. Expect it to be supppperrr busy for the next 3 months. I was happy to see what the prices were going to be. So ya thats it? What about a new phone or something? Nothing? Great, a migration fee. I can’t wait to have to explain that to customers. so can we switch to one of these plans if we already are on board? @anthony – look at pic #4, that will tell you what will happen depending on what your current contract status is. Unless you sign a new 2-year agreement after 10/25, you’ll just pay a $35 activation fee per line and move over. What I want to know is if the text and data is unlimited no matter how many minutes you choose. 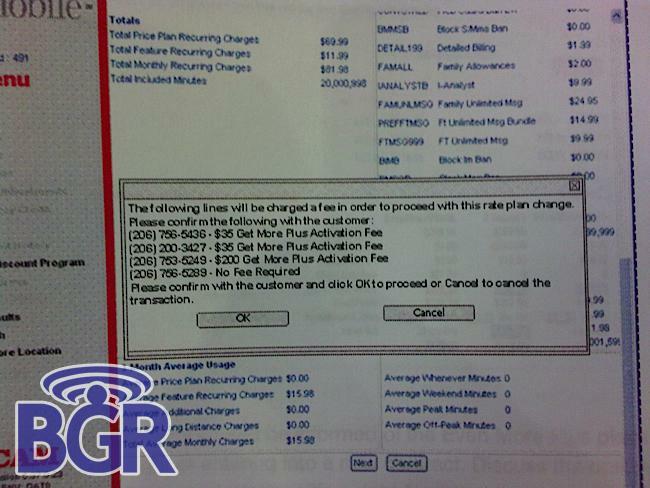 Also, why, on pic #1 (obscured under the BGR logo) is there a separate fee for “Unlimited Web for Smartphones”??? I thought that was the point of all this nonsense… unlimited plans! Kinda Looks to me like that is already included. The price is x rather than eraser tool…. With this I will be getting a new phone every 20 monthes as I pay one off after another. If I see one I really like Ill speed up paying the current phone off fater. I have the G1 and already wishing I had a newer phone. 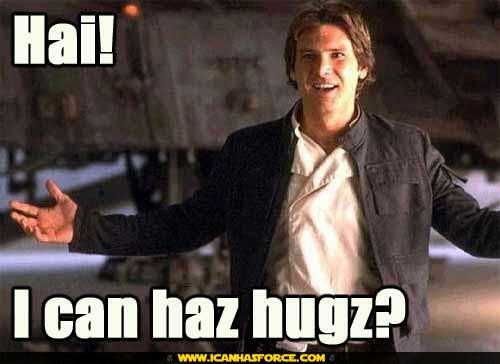 Wish the Droid was coming though. Im sure a similar phone will be coming later on T-Mobile. i’m eagerly awaiting to find out what this project dark, or whatever it called is. there has been so many speculations, but nothing has been confirmed. i guess we will find out in a week exactly what it is. i have been a t-mobile customer since back when they were voicestream and never left. trust me i have thought about jumping ship a few times due to the limited phones they had and where i live the reception is not the best. but i chose to ride out with them. it seems as though now t-mobile is finally starting to get some noteworthy phones. guess will just have to wait until next weekend to find out officially what this project black is. i do hope it is something big which will propel t-mobile from the #4 to the #3 spot and soon to #2, a person can dream can’t they. but when i go to thee tmo store, they tell me i have a mnth-to-mnth contract? what’s that? is it really a contract? &will i be able to get new phone, &unlmtd plan? What !!!!! This is it ? 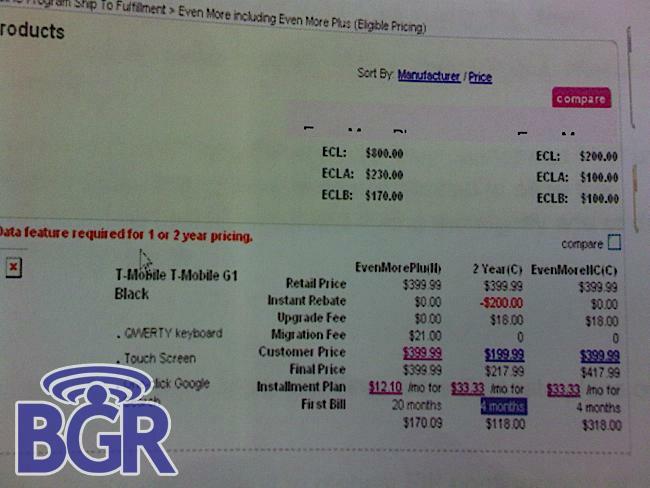 Anyone notice that the subsidized price for a G1 on the last page is $199.99? That better not be an example of their new phone pricing. T-Mo hasn’t had this much buzz on the intertubes since the run up to the G1 launch. They may have “allowed” obscured leaks and oblique references as part of marketing. Major issue with the family plans which makes this a no-go for me. They offer an unlimited family plan, which I assume includes two lines. They then say you cannot add any additional lines to the unlimited plan…only to those with 1500 or 750 minutes. For all of us who have kids, and need a family plan to cover them you have just killed the entire benefit of the program. For many family plan means 3 or 4 or more…not just two. Just because we are geeks doesn’t mean we don’t reproduce!! @sprinter. if you look below that in the very bottom right of the picture, it looks like there is a different price for adding a line to unlimited plans vs adding a line to a shared minute plan. you need to take another look! There are additional lines with unlimited. It’s option 3 on picture number 1. The first option is for the 750/1000 plans and is most likely cheaper than the unlimited option. Probably still 9.99 like you are paying today. 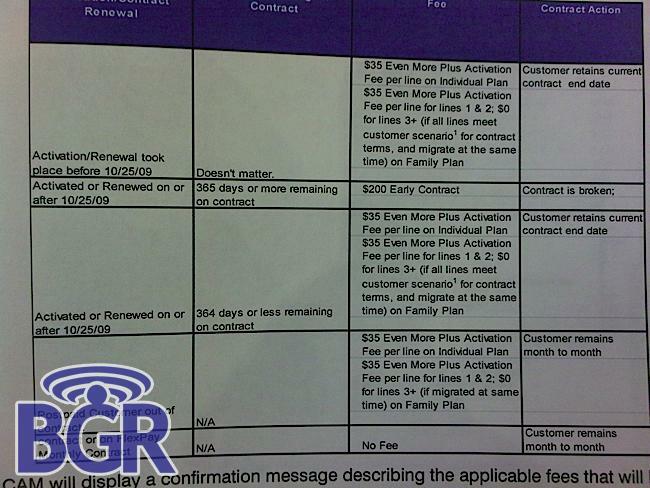 Why would they give each additional line on an unlimited family plan its own separate pool of minutes? That doesn’t even make sense. Just another example of why TMO is stuck in 4th……people cant keep their big mouths shut. I guess your word to not say anything is worthless. Great! can someone explain to me how does this benefit me i have a family plan with 2 lines both tp2 unlimited web and no text and i pay 120 right now. my question is will their be a family unlimited data n web with 1500 minutes plan like sprint or something similar? this dude is def. getting fired. for one, they probably know what store it came from, cause the 206 area code and the next 3 numbers will narrow it down. then they just find out which rep worked on it and he’s right behind me in the unemployment line. but it was def. worth it. he took one for the team. plans are really good but, i need a major hardware upgrade. just gimme UMA androids so i can use them @ home and work. i’ll buy 2 of them, one for me and one for my wife. i’ll keep my hotspot@home and my t-mobile@home services. do that and t-mo has me for life. i’ve been here since the ariel/voicestream in ’01 so this aint my first rodeo. on the flip side anyone else who gives me a femtocell or UMA android and it’s bye bye bye and ebay will have a lot of good used t-mo hardware up for bid. So if existing customers have to pay a $35 activation fee for the new plan will we also be able to get a new handset at a new customer price? Ok so what else is coming that’s gonna make this game changer? ?..is the HD2 with android coming?? oops…missed that..I see what you are saying. 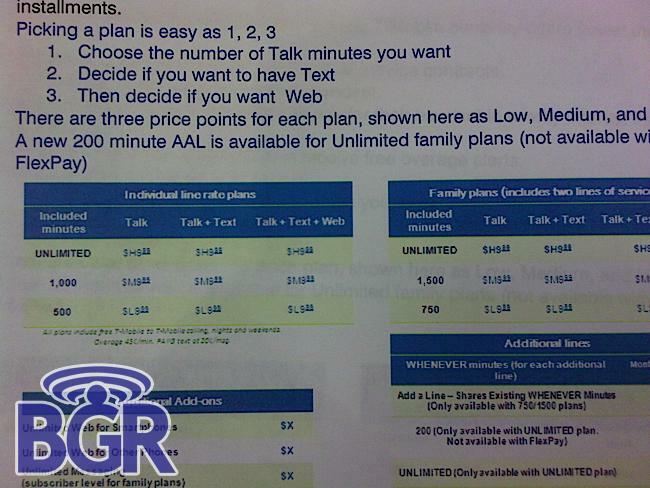 It looks like for a family unlimited plan you can add extra lines beyond the two. It looks like you can either give those additional lines 200 minutes or unlimited minutes (I assume cheaper to give them 200 minutes) Being that kids end up texting and not talking, 200 minutes will be plenty. One thing I am a little confused on…currently with T-mobile you have to pay for data separately for each phone…in this case is their just one fee for all the phones to have data? Will additional family plan phones have data and text if the primaries have it. Much to be figured out to understand if this is a good deal for the family. 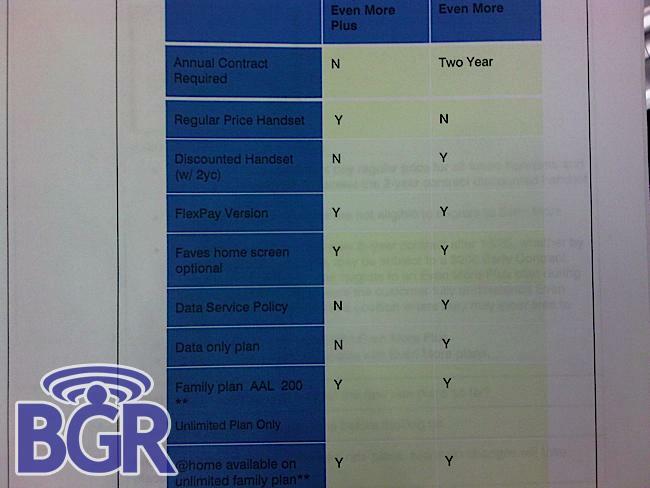 One thing Sprint really messed up was the family plans..they made it so expensive for additional lines to have features that kids never used. I can’t wait for this to come out. I have been with t-mobile for a while now and have been waiting for something big to happen. They have finally started carrying better handsets (finally) and now they are making some big moves. They have to have good phones with low prices to compete with Metro PCS down here in FL!~ I have a metro PCS phone for work and my t-mobile for personal but if this works out then maybe I can have both on the same network which would be lovely because I hate having to pay 2 seperate bills each and every month! the ‘Other’ tmobile site )tmotoday.com( has some more screenshots as well, but they show the whole screen. its looking big whatever they have planned. when will we hear definite news about the new devices? all i have to say as a TMobile usa insider is that the N9700 and HD will be comeing to tmobile! oh and these plans Will be game changers! I come to your site to look at “phones” and new updates all the time but this is counter productive to what Tmobile is trying to do. The purpose of this not being leaked is to keep the other companies on their heels as to what it could be and so they don’t rush to put something out similar first. If your goal is to help Tmobile why would you leak the most important wireless change to date a week early???? Its very disappointing. Its not like Tmobile still won’t come out with the plans (obviously) but this is a chance for Tmobile customers to feel like they have something special and only for them. You’ve just giving the other companies a chance to build a similar diagram and release it before the weeks end or the make another announcement to rival this. I understand building hype but I think they hype was already there. If you notice, I wasn’t the person who leaked this. I am simply reposting what another website leaked. This looks like a confusing hot mess. I hope it’s clearer when it comes out. More confusion about plans isn’t going to help them…that was all confusing to read. Im sorry to flame, he deserved it. @dand: You just called a man an idiot who had the most valid point that anybody has actually made on this forum. @David: I myself am a T-Mobile employee. I understand that you get your leaked information from T-Mobile employees. I wonder what they get out of it? Do you pay them? Do they get the noteriety of being “first?” Because by the amount of advertisements I see on your website that you sure make money by revealing T-Mobile information before T-Mobile announces it. It suprises me that you supposedly love T-Mobile as a company so much, just like the other sites, but you’ll be the second to sell them out (the first being some unloyal T-Mobile employees, which should just quit the company anyway). You love them so much, but you own one of the sites that is blowing up T-Mobile’s marketing plan. I understand that you and your website attempt to create the hype around T-Mobile products, services, etc. but as disappointedTmobilecustomer stated, there already was enough hype surrounding this. I checked your site last night and noticed that you removed the material, which was a smart choice. And here I am this morning with the material plastered in front of me. I really don’t believe you love T-Mobile, you and your cohorts that “leak” want to change the wireless industry, but you very well could have ruined the best shot of that. @the people who WANT this information leaked – I understand you want to know what’s going on. It also makes sense that you all want to knoww hat t-mobile has coming down the pipeline because it makes you feel better every day about being a T-Mobile customer, HOWEVER…There’s a reason why Theme Parks hide the rides they’re building until after it’s completion. There’s a reason why companies have private beta testing and NDA agreements for the products they plan to release. It’s so that the competition can’t come back and make something even better before they have a chance to even release their product. As much information that comes through the pipeline, you’d think that people would understand that this is a SERIOUS move for T-Mobile, and giving information away to other companies can cause problems. T-Mobile is facing the loss of the support of their parent company if they can’t turn things around, and people are getting upset that T-Mobile is trying to keep something a secret so that they can have an edge on the comp. We’re not talking adding more 3G cities. We’re not talking a new phone. We’re not talking a simple plan price change. We’re talking something that’s bigger than ALL of that. Yea…I’d wanna keep it low key too if I was T-Mobile. @the people who DONT want this information leaked – I agree with you on the side of T-Mobile needs to be able to keep things secret in order to have an edge on the comp. HOWEVER…it’s not like this information gave a whole lot away. It tells people that there will be changes in price plans, yet doesn’t mention a price(which we all know pricing is available and I’m glad you didn’t leak that info either). It gives some Y/N answers to basic questions, but doesn’t really explain how anything will work. Until I actually found out everything thats going to happen, these screen shots were more confusing than anything else. They excited me because I could tell a huge change was coming and did exactly what you’d expect…built anticipation. But honestly…admit it….unless you KNOW what’s going on…it’s almost impossible to decipher this information lol. So yea…the big picture needs to be kept a secret, but the information available from the screen shots doesn’t do anything but give a taste of what’s to come. It’s like getting a bite of the best Cheesecake you’ve ever eaten, but told you’ll have to wait until after dinner to get the rest. It doesn’t ruin anything, just builds hype. @ mike…whether companies admit it or not, in GENERAL, leaks are good for business. It causes chatter(especially in a situation where there’s enough info to give an idea of what’s to come, but not enough to give it away), that chatter leads to speculation, speculation leads to anticipation, anticipation leads to people hoping on the band wagon the moment a seat opens up. Companies often times CREATE the leak on purpose for that exact reason. The only times NDA agreements really come into play is durring beta testing of a product/service and/or if you’re dealing with the government. For the most part, lower-level employees don’t know enough about something long enough before it’s released in order to have an impact on anything. Usually they only know a few days before the rest of the public does. It’s just interesting that people who never cared about leaks before all the sudden care about this one. It WILL be a game changer for T-Mobile…but like someone said earlier, don’t grow a conscious after all this time of not caring. That being said, there’s a difference between a conscious and caution. A conscious means you feel bad about something, caution means you think it’d be more beneficial to not take a particular action. I think in this case, that’s what this site had done before. I don’t think the CARE about what leaks, I think they just wanted to use caution in exploiting this particular leak. I’ve beta tested for T-Mobile before, I could care less if I tell someone what exactly I’m doing, but I choose not to(caution) because if they find out it’s me, I won’t be a beta tester anymore. You know…. I find it pretty stupid that whoever took these pics actually took a picture of someones account with all the phone numbers… yet none of the editors blurred them out. Can we say Lawsuit? I know if someone just posted my number(s) all over the internet without my permission I would hold someone accountable. And which ever Tmobile employee took these… man your dumb. Even if this isn’t their numbers I am sure there is a way to find out who was testing this new system setup using these numbers and that will confirm the photographer and anyone involved. Like someone posted before I am sure someone (or some people) were fired. Hopefully whoevers numbers are posted knows about this because now anyone can just call them if they haven’t already. More than likely these numbers were of someone involved in all of this and if they were willing to share this information on the internet by letting someone take pictures of this I am sure they would have no problem taking phone calls from the competion for a price. @ JBLmobileG1 – #1 – That’s probably just dummy account info. Someone probably took pics while training on the new stuff and posted. The fact that it’s a Seattle, WA account gives credence to that since T-Mobile is based out of WA. #2 – I’m not AFRAID that I won’t be a beta tester anymore…I could care less. I just like knowing stuff before other people do. It really doesn’t bother me. I’ve only done it twice over the past year, I was fine before I was a beta tester, I’ll be fine after. #3 – You took what I said and twisted like nobody’s business. Notice I said “in general” meaning, USUALLY…that doesn’t mean they don’t care at all. AND, most leaks are about products/services that people already know are coming anyway, usually because some CEO of some company mentioned it in a press conference. The G1 wasn’t a leak, T-Mobile AND Google mentioned it openly in press conferences. 3G and the cities it was coming to wasn’t a leak, people knew it was coming thanks to T-Mobile press conferences, they just didn’t know when. When a company wants to keep something under wraps completely, the know how. Think about it…how many people here had NO clue 3G was coming until it lit up in there city? They may have known an estimation(which quarter it was coming) but they had NO idea what day. How many people here knew about the 21mbps upgrade that happened in Philly before it happened? Nobody? Why? Because T-Mobile didn’t want it out, they just did things without giving an opportunity for it to leak. Think about this…if this information was never leaked, how many people would REALLY care about Project Black? If T-Mobile just all the sudden one day said, we’re gonna give out free handsets for 1 month to every person in the world for some sort of a publicity stunt, it’d take a week or two before everybody even knew the deal existed. As I said, leaks create chatter, chatter creates hype, hype leads to people jumping in the water as soon as the pool is filled. If info about the iPhone had never been leaked, how many people do you think would’ve cancelled their contracts in those 3 months before it was released because they wanted to get a phone on a different carrier? Let’s say it was just 100(which im sure is VERY low), and lets say each person had a $40/month plan. Thats $4000/month they would’ve lost. Which over the life of a contract is $96,000. Let’s say just 50 of those people decided to stay to get the iPhone, not only do they keep from losing $24,000/year, they also actually get MORE money from the reps who stayed because now they have to purchase a data plan as well. People who probably upgraded to the 3G when it came out, and then the 3GS when IT came out. Leaks are not always bad, sometimes they are, but more than not, it just creates a hype around a product/service. As they say, no publicity is bad publicity. Uhhhhh if this site is owned by T-mobile, then I need some serious backpay! You have to be a complete itiot to not take this plan. Most of us on individual plans pay at a minimun with smartphones: 39.99 for individual myfaves 300, then 34.99 for unltd data+msg=$74.98/month……. What are you gonna do?……I’m getting the new plan! !